While waiting for my computer to install Dragon Age Origins, I decided to play a little bit of The New Super Mario Brothers Wii. This is what I thought of it so far, keeping in mind that I've only played up to World 1-4 and have not played the multi-player mode. You can actually control the teeter toter by tilting your WiiMote. Fun, eh? The story is the same basic affair. You're hangin' out with Princess Peach, something happens, she gets kidnapped, blah blah blah blah blah we've all heard this before. This time, however, Peach is not only kidnapped by Bowser Junior, but the eight other Koopa kids as well. It's a good thing, because I thought Mario murdered all of them in Super Mario World. 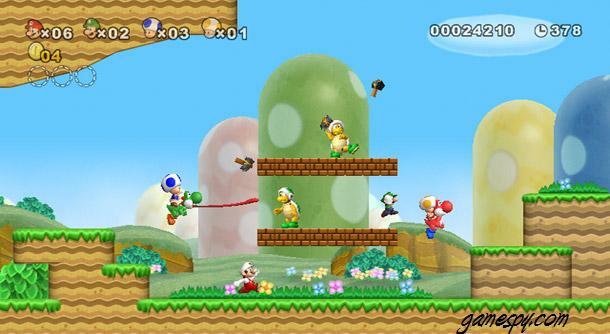 Besides the new power ups, we see Yoshi returning in all of his side-scrolling glory. Unfortunately, because of playing the later games, I kept on expecting that every time I would eat an enemy, and egg would pop out. 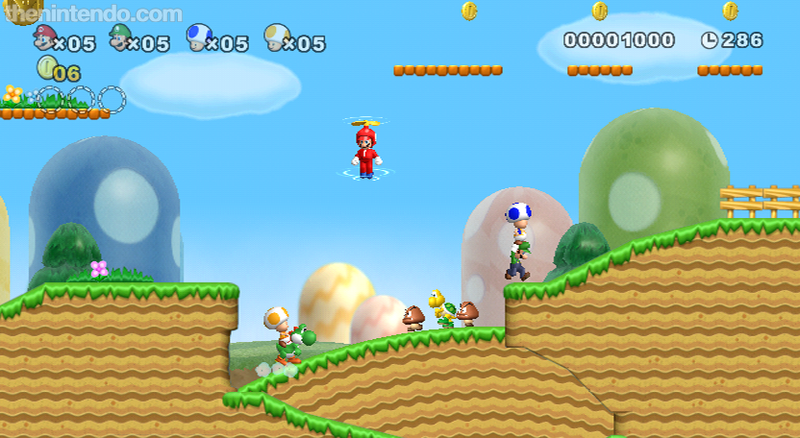 Yoshi this time around acts more like the SMW Yoshi, but that's not a bad thing. Just something to get used to. The new power-ups are pretty neat as well. Though I haven't gotten to play with the Penguin Suit, I had fun with the "Propeller Mushroom" and the "Ice Flower." When equipped with the Propeller, flick your wrist to make your character spin high into the air. It's a pretty cool power. However, the Ice Flower dominates it in usefulness. Though they don't have as long of a range as fireballs, the snowballs can freeze most enemies. After they're frozen, you can use them as stepping stones or projectiles (much like a turtle shell). These snowballs can even defeat Dry Bones, a monster that proved impossible to kill in the original DS version. This picture is pretty busy. 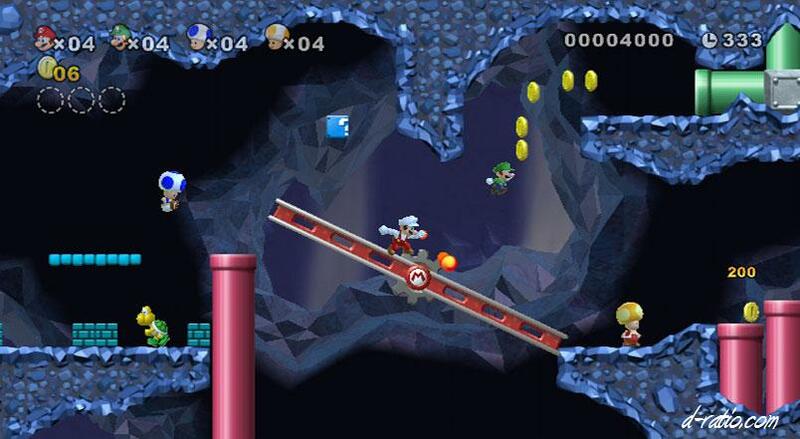 It has a Yoshi, a Propeller Hat, and Luigi carrying a Toad off to his doom. My only complaint, and it's a big one, is that the game play seems sluggish. The characters seem to move at a noticeably slower speed than normal, making this game a bit more of a task to get used to. Also, there seems to be a split second delay between pushing the button on the WiiMote and the character actually doing anything. I understand why they did this, however, since four players are on the screen at the same time. Still, my timing is off, and it's a little annoying.